It is a Friday evening in July and the weather forecast for Saturday isn’t looking that great. A dry start, but a front forecast to come in from the north-west in the afternoon bringing rain and a stop to a great week of climbing. So we hatch a plan which requires us to travel to pretty much the furthest point from Lerwick by road with two ferry crossings in the hope of climbing a couple more new lines before the rain comes in. Sensible? Well this is Shetland and “Nothing ventured …….” as the saying goes! We arrived in time to catch the 8.45 ferry from Toft on the mainland for the twenty minute crossing to Ulsta on Yell. Fortunately the ferry was prompt and we were at the head of the traffic off the ferry, making the seventeen mile dash across Yell to Gutcher on the North-East side of the island to catch the 9.30 ferry to Unst. As we headed across Unst for the Skaw Point, our chances were looking slimmer by the minute. Dark clouds were gathering and the wind was also picking up. 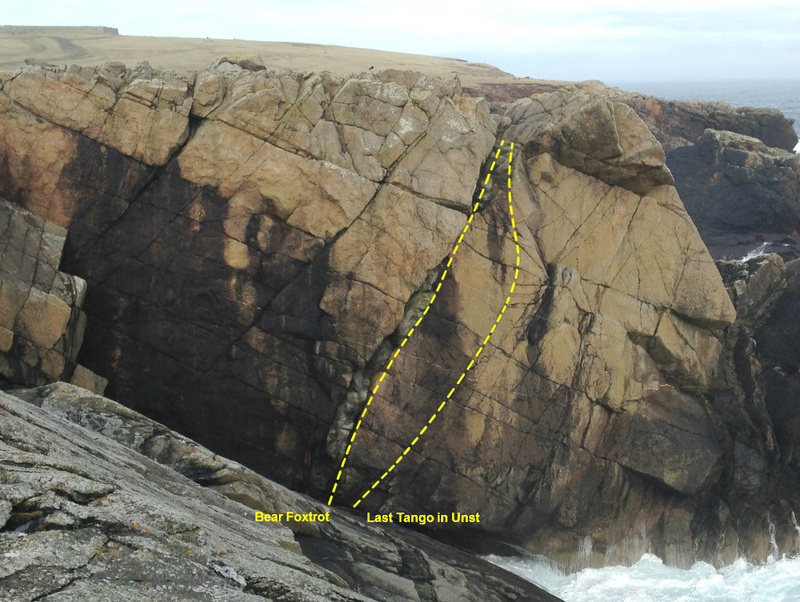 On the plus side, the crag is nestled down on the south side of a peninsula and protected from the north-westerly swell. We pressed on, past the now closed RAF radar base at Saxa Vord which used to play an important role in watching the skies during the Cold War Era, to Skaw Point. Our destination was a wild and lonely peninsula of land with the abandoned shells of military buildings from another radar station that closed down in 1947. The crag is a perfect west facing hanging wall of granite, broken on the left side by an igneous intrusion that breaks up the wall. It is located a few hundred metres further East between an outcrop called Crickies Chair and the established crag at The Buss. We parked up eighty metres from the crag. Mark and I geared up at the van and made a dash for the crag just after 10.00 with showers dotted across the horizon. I had the first lead and opted for a line that broke up the left side of the main section of the wall. 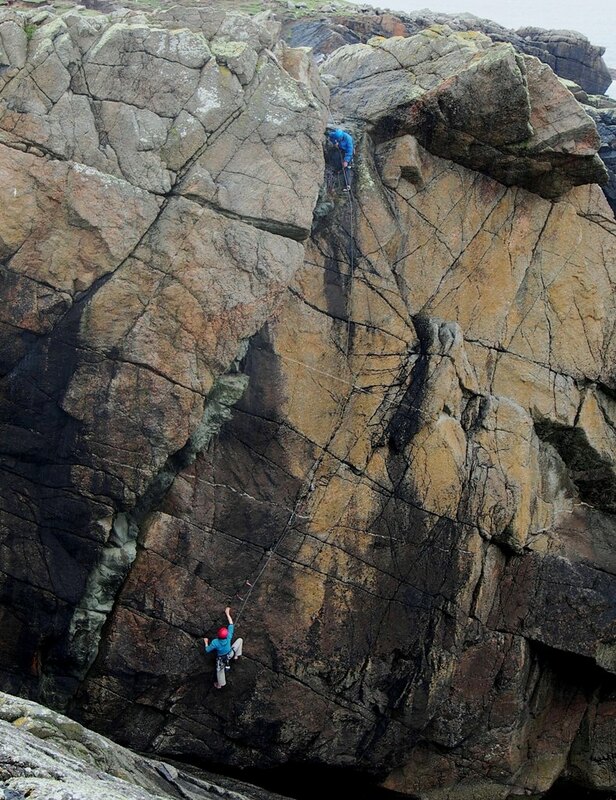 The intention was to use a mixture of holds on the igneous intrusion and the granite but, with very few breaks and cracks on the steep granite, the route was quite unnerving with the requirement to pull up on sections of the intrusion without ever knowing just how strong it was. By half way up the weather had already started to turn and a fine mist was blowing over the top of the crag but another ten minutes later and I had pulled out onto the top of the route and into the clag! Mark followed up and we called the line Bear Foxtrot – a link to the interception of ‘Russian Bear’ Tupolev Bombers that still occur in the skies over the North Sea. 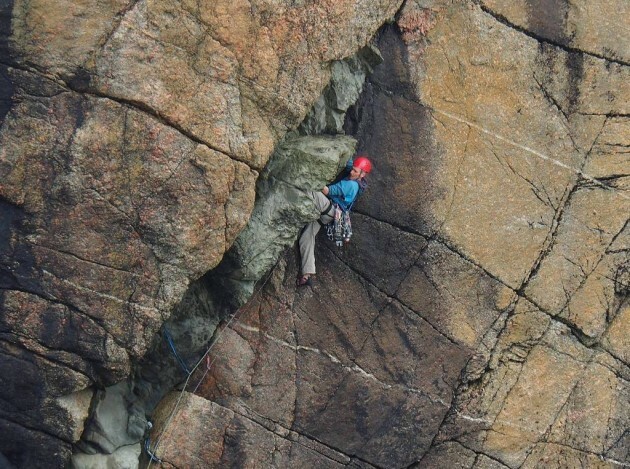 With the arrival of rain imminent we scrambled back down the sloping ledges to the bottom of the wall and Mark geared up and set off up a hanging right slanting crack line up a face of perfect granite. The climbing is stiff and with few rests, but well protected. Mark pressed on, still dry, up the steep rock as the rain drifted in over the top of the crag and the ledges below became soaked. At the chance of a pull out on to a rest near the top, Mark stayed on the hanging wall keeping the line direct and sustained. The final moves were more than a little unnerving as they were wet from the now continuous rain. A stunning and sustained three star route that provides the best climbing we’ve found so far at Skaw Point. By the time I arrived at the top of the route it was pouring down and Mark was already soaking. 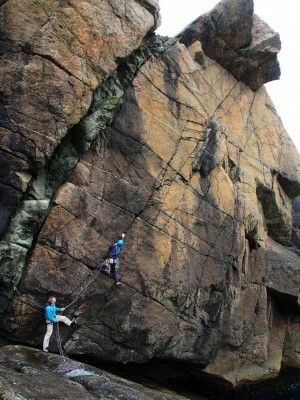 But hey, we had just successfully snatched two great routes before the weather had stopped play. What’s more it was only eighty metres back to the van and a warm brew. 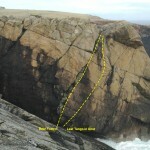 Mark’s line is called Last Tango in Unst. © 2019 ShetlandClimbing.info. All Rights Reserved.